SIMA-CEFAR MGP semiauto combat handgun. 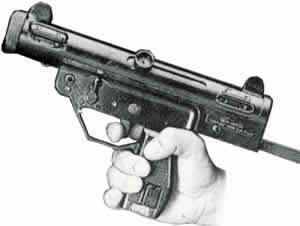 The SIMA-CEFAR MGP semiauto combat handgun (.9x19mm-Parabellum, 15-rounds clip) is a semiauto version of the SIMA-CEFAR MGP14 submachinegun. It entered service with the Peruvian army as the standard sidearm, replacing the Browning High-Power (also produced by SIMA-CEFAR for official use in Peru). It's also available in that country and in the nearest South American states for civilian sales. I don't know how Peruvian soldiers carry this weapon, maybe using a special holster 'cause it's pretty big.